Explanation: Sometimes both heaven and Earth erupt. Colourful aurorae erupted unexpectedly a few years ago, with green aurora appearing near the horizon and brilliant bands of red aurora blooming high overhead. A bright Moon lit the foreground of this picturesque scene, while familiar stars could be seen far in the distance. 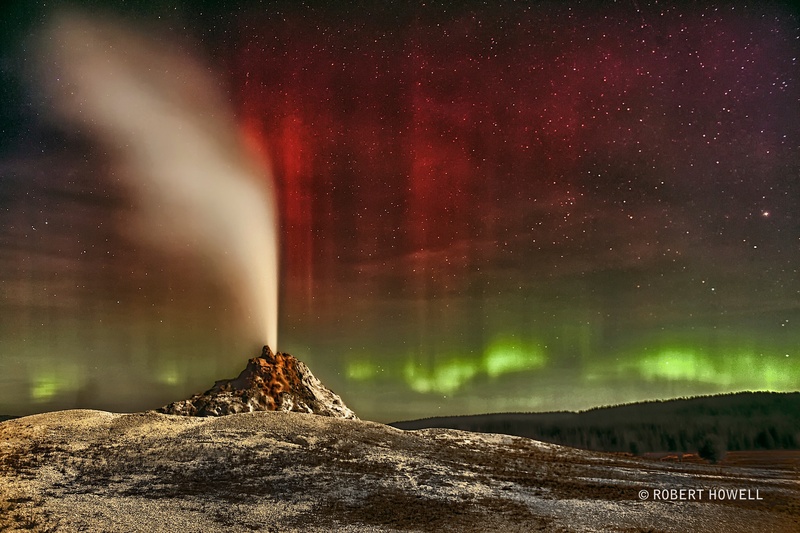 With planning, the careful astrophotographer shot this image mosaic in the field of White Dome Geyser in Yellowstone National Park in the western USA. Sure enough, just after midnight, White Dome erupted -- spraying a stream of water and vapour many metres into the air. Geyser water is heated to steam by scalding magma several kilometres below, and rises through rock cracks to the surface. About half of all known geysers occur in Yellowstone National Park. Although the geomagnetic storm that created these aurorae has since subsided, eruptions of White Dome Geyser continue about every 30 minutes.